When developing your value proposition, you need to keep it clear and concise. Write down everything you can think of about your business. Don’t skimp. Just write. After you have written down everything you can think of, look at what you wrote and circle everything that you do that your competitor doesn’t do. You will also want to look at your target market and see what they have in common. You will need to do market research to find this out. When you find out what your market wants, take a look at your list and see if you match their needs in some way. If you do not, find a way to add it, or alter something you wrote down that will allow you to add it without significantly changing anything. Once you find what your market needs, you can develop your value proposition around that need. When you develop your value proposition, keep in mind that it is to identify and satisfy a need that has not been met. Your value proposition can provide a lot of value and benefits to your business. You can show how you differ from your competition. By showing you are better; you will be able to increase your business by winning over more people and gaining a larger customer-base. Here is an example of a value proposition:We not only provide bouncing inflatables for your kids’ entertainment, but we also have a car pool and will pick your kids up and take them to the event, if necessary. What a value proposition. This company will go far since they provide an additional service to their clients. Just keep in mind what a value proposition is. It is mainly a way for you to show others what is different about your business. if you can show how your business differs and is more unique, you will win over customers and will get the business. This is why you have to concentrate and focus on your value proposition. Never rush through it. Give it careful thought and consideration. If you do, you will find you will be able to develop a really great one, so don’t skimp on it. Take your time and figure out what your business is all about. Understand what your business is for. When you have a clear reason for what your business is about, you will be able to understand what your value proposition is, or should be, and develop it fully. 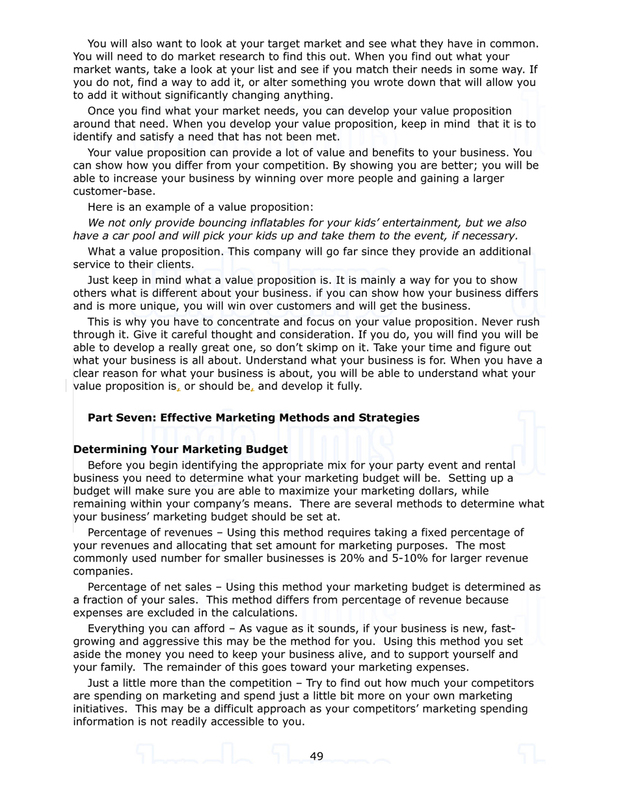 Part Seven: Effective Marketing Methods and StrategiesDetermining Your Marketing BudgetBefore you begin identifying the appropriate mix for your party event and rental business you need to determine what your marketing budget will be. Setting up a budget will make sure you are able to maximize your marketing dollars, while remaining within your company’s means. There are several methods to determine what your business’ marketing budget should be set at.Percentage of revenues – Using this method requires taking a fixed percentage of your revenues and allocating that set amount for marketing purposes. The most commonly used number for smaller businesses is 20% and 5-10% for larger revenue companies.Percentage of net sales – Using this method your marketing budget is determined as a fraction of your sales. This method differs from percentage of revenue because expenses are excluded in the calculations.Everything you can afford – As vague as it sounds, if your business is new, fast-growing and aggressive this may be the method for you. Using this method you set aside the money you need to keep your business alive, and to support yourself and your family. The remainder of this goes toward your marketing expenses.